Click here to become a fan of our new Facebook page and you will be eligible to win a $250 Global Hemp Store Shopping Spree. We will draw for the winner as soon as we reach 1,000 fans. Help us reach 1,000 fans fast, so we can award the prize! No purchase or entry fee required. You must remain a Fan until at least the contest is over. The Global Hemp Find us on Facebook 1,000 Fans Drawing (the “Drawing”) is open to legal residents of the United States and the District of Columbia. Employees of Global Hemp, Inc., and any of their affiliate companies as well as immediate family (spouse, parents, siblings and children) and household members of each such employee are not eligible. This contest is subject to all applicable federal, state, and local laws and regulations. This promotion is intended for viewing only in the United States and the District of Columbia. By participating in this drawing, entrant fully and unconditionally agrees to and accepts these Official Rules and the decision of the Sponsor and/or Administrator, which are final and binding in all matters related to the drawing. The Global Hemp Find us on Facebook 1,000 Fans Drawing begins on June 14, 2009 at 12:00 a.m. Central Standard Time (CST) and ends when the Global Hemp Facebook Page reaches 1,000 fans. The winner will be randomly drawn and announced within 30 days after we reach 1,000 fans. Beginning June 14, 2009, individuals can access the Global Hemp FaceBook Page and select the “Be a Fan” link. To access this page, you can click on the link on the Global Hemp Store homepage at store.globalhemp.com or go directly to the Facebook page at http://www.facebook.com/globalhemp?ref=volusion. To be a fan of a Facebook page, you must have or create a Facebook account. For information and guidelines about obtaining a Facebook account, visit Facebook.com. 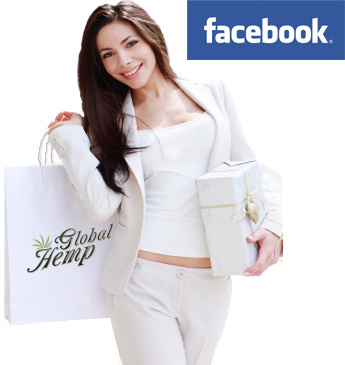 Global Hemp Store or Global Hemp, Inc. has no affiliation with Facebook. The winner may be requested to provide proof of their US residency. Drawing winner will be notified by email within 30 days of the Global Hemp Facebook Page reaching 1,000 fans . If the winner cannot be contacted within ten (10) days of the date notice or attempted notice is sent, or if the winner cannot provide valid proof of US residency, he/she forfeits the prize and another winner will be drawn. Acceptance of any prize shall constitute and signify winner’s agreement and consent that sponsor may use the winner’s and name, city, state, photo and/or prize information in connection with the contest, worldwide, including the Internet, without limitation and without further payment or consideration, except where prohibited by law. ONE (1) GRAND PRIZE: One $250 Global Hemp Store Shopping Spree will be awarded to the drawing winner. The winner will be provided with their chosen merchandise. The prize will be shipped to the winner by Global Hemp, Inc. For all prizes: Limit: One (1) prize per person/per valid email address. Prizes are nontransferable and no substitution will be made unless sponsor, in its sole discretion, determines otherwise. Sponsor reserves the right to substitute a prize for one of equal or greater value should a prize become unavailable for any reason. Winners are responsible for all taxes (state of Illinois and only if applicabile) and fees associated with applicable prize receipt and/or use. Sponsor reserves the right to cancel, suspend and/or modify the contest, or any part of it, if any fraud, virus, bug, technical failure or any other factor beyond Sponsor’s reasonable control impairs the integrity or proper functioning of the contest, as determined by sponsor in its sole discretion. Sponsor, in its sole discretion, reserves the right to disqualify (including, without limitation, any individual it finds to be tampering with the entry process, the voting process, or the operation of the contest or to be acting in violation of these Official Rules or those of any other promotion or in an unsportsmanlike or disruptive manner. Any attempt by any person to deliberately undermine the legitimate operation of the contest may be a violation of criminal and civil law, and, should such as attempt be made, sponsor reserves the right to seek damages from any such person to the fullest extent permitted by law. Sponsor’s failure to enforce any term of these Official Rules shall not constitute a waiver of that provision. The Released Parties are not responsible for: (1) any incorrect or inaccurate information, whether caused by an entrant, printing errors or by any of the equipment or programming associated with or utilized in the Drawing; (2) technical failures of any kind, including, but not limited to malfunctions, interruptions, or disconnections in phone lines or network hardware or software; (3) unauthorized human intervention in any part of the entry process, the voting process or the Drawing; (4) technical or human error which may occur in the administration of the Drawing; or the processing of entries or votes; (5) late, lost, undeliverable, damaged or stolen mail; or (6) any injury or damage to persons or property which may be caused, directly or indirectly, in whole or in part, from an entrant’s participation in the Drawing or receipt or use or misuse of any prize. Sponsor is not responsible for misdirected or undeliverable entries or votes or for any technical problems, malfunctions of computer systems, servers, providers, hardware/software, lost or unavailable network connections or failed, incomplete, garbled or delayed computer transmission or any combination thereof. Sponsor and Administrator are not responsible for any typographical/other error in entries, announcement of winners or other Drawing materials, including these Official Rules, or for any liability for damage to any computer system resulting from participation in, or accessing or downloading information in connection with this Drawing. *Facebook is not a sponsor of the Drawing and has no responsibility or liability regarding the conduct or administration of the Drawing.